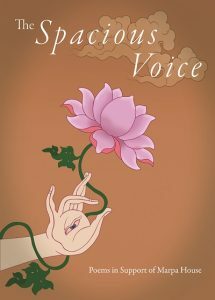 The Spacious Voice is a little gem of Buddhist poems. Influenced by the Karma Kagyu tradition of Tibetan Buddhism, 31 poets from around the world contemplate their experiences from a Buddhist perspective. Chime Rinpoche, one of the last traditionally trained reincarnate Lamas, has also made a very generous contribution to this very special booklet. All profits from the sale of this book will go towards the upkeep of Marpa House. Please add postage and packaging costs as appropriate. If you require more copies, please contact us for a price.